A dramatic portrait gallery of some of our planet's former residents down through the eras, with pithy odes in rhymed or free verse...Many of the informal facts and observations he adds at the end are just as memorably phrased. Highlights from life's last 544 million years infused with humor and wonder. It’s not just dinosaurs profiled here; the book heads all the way into the Quaternary period (that’s the one we’re currently in) and introduces creatures like the saber-toothed tiger (“Smilodon”) and the Woolly Mammoth (“Mammuthus”). Trueman’s full-bleed, vibrant portraits bring these long-extinct animals to energetic life, and a final spread offers up more scientific facts. A journey into the past that’s a visual and linguistic joy. Elliott’s clever, winking poems are chiefly interested in keeping readers entertained: “Some way you were among/ the first to leave the ocean/ and touch the wet black earth,” he writes as an armored Eurpterus slinks out of the water. “We’re glad you did,/ for what it’s worth.” But closing notes should satisfy their curiosity about these ancient beasts—or send them searching for additional information. Trueman’s dynamic, creatively composed mixed-media illustrations plunge readers into past environments using awesome, sometimes scary perspectives: up close to the bloodied jaws of a carnivorous Dimetro- don, underneath the massive tail of a Brachytrachelopan or a striking Titanoboa, and within the giant ferns of the Triassic Period. Any subject as simultaneously mysterious and accessible as the wide ranging and exotic animals that have roamed the earth deserves to have volumes of poetry written about it. This collection of poems is a good start. In this terrific picture book for 3- to 7-year-olds, we see the coiled terror of the snaky Titanoboa, a mist of blood around his attacking jaws. And here is the nightmarish Yutyrannus, feathered like a chicken and built like a T. rex. David Elliott has written captivating odes, at turns jaunty and wise, for each animal. 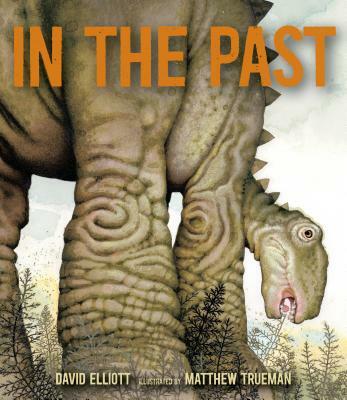 Prehistoric creatures and poetry? Perfect match! Humorous but informative verse will be sure to inspire little word-loving scientists.